The ever-important Camerons also had a camp on the rim. The Red Horse Station was the last stop on the Flagstaff stagecoach line. The trip itself took over 2 days. Stops were necessary for fresh air and stretching and also to change out tired horses. As the railroad and personal cars became the main modes of transportation, Ralph Cameron saw a golden opportunity. He physically moved the cabin to its present location, log by log. Beginning in 1902, it served as a 2-story hotel and post office. Fred Harvey asked for the building to be destroyed in the 30s, by Mary Jane Colter asked for its preservation because of its handmade charm. The building was converted by Colter to a 2-room cabin in 1935. Both the Cameron Hotel and the O’Neill cabin have undergone renovations over the years and are still available for rent today. 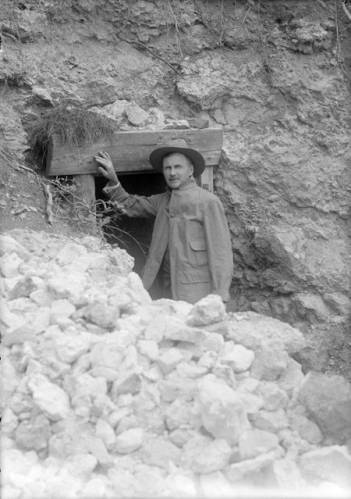 Ralph Cameron Posed at an Old Mine Shaft.